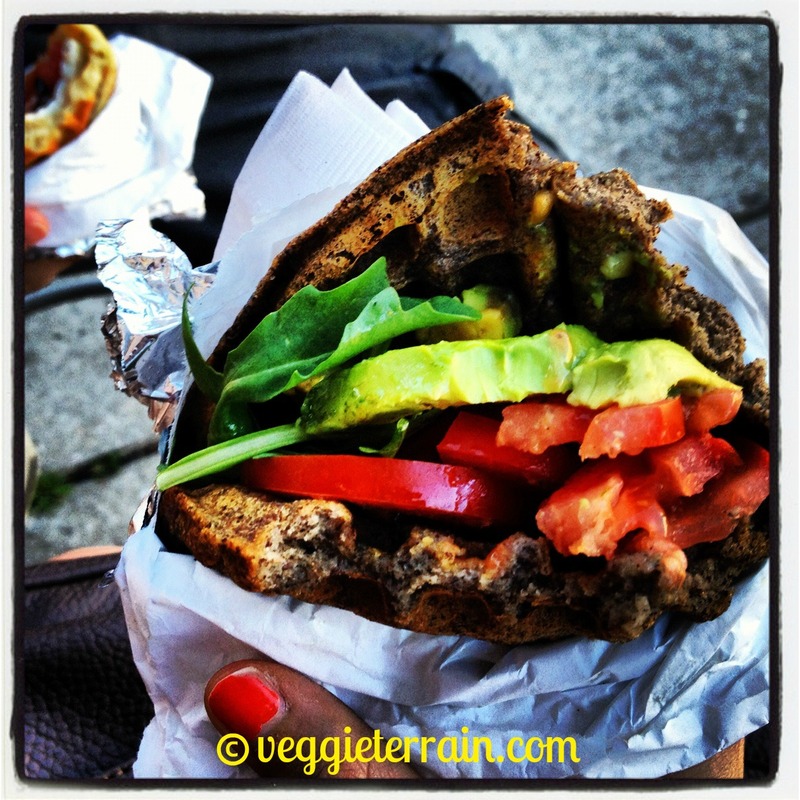 RESTAURANTS THAT ARE SECRETLY VEGAN (friendly)! Did I just shout that? Oops. Thing is, living in NYC, I'm often asked for vegan restaurant recommendations, which I'm more than happy to share. (And by "more than happy," I mean "elated.") Sometimes, however, I'm even more excited to suggest places that are secretly vegan. While I wholeheartedly support entirely veg restaurants (I'm looking at you, Sun in Bloom! ), I also think it's important to frequent restaurants that are vegan-friendly. Not only does doing so raise awareness about veganism, but it also encourages restaurant owners to offer their customers even more veg items (we can vote with our dollars, as they say). Another upside is that non-vegans/vegetarians will be exposed to (and possibly consider) meat-free options, simply because their "regular" places offer them. 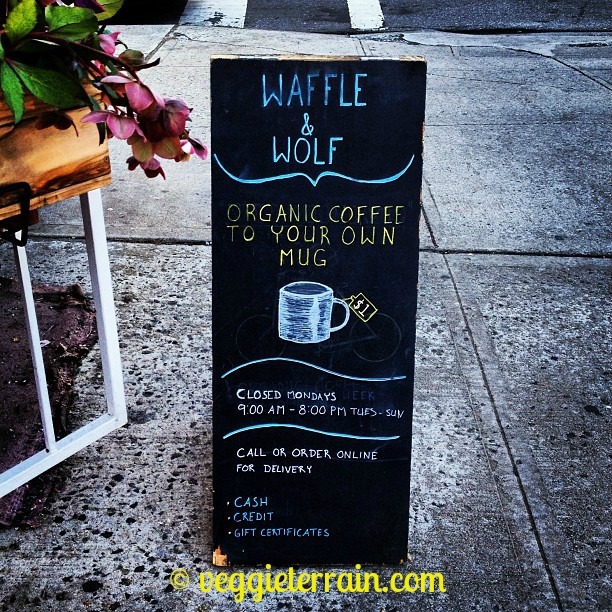 On that note, I'd like to share one of my favorite secretly vegan places with you: Waffle & Wolf. This little gem is located in Williamsburg, Brooklyn (AKA the place people visit in order to become hipsters). And it specializes in - you guessed it - waffles! These waffles are basically sandwich-ized: folded in half with all manner of scrumptious fillings stuffed inside. Feeling savory? Try hummus, avocado, kale chips, spicy tomato jam, pickled cabbage, or arugula in your waffle. Looking for something more sweet? Go for blueberries, oranges, roasted apples, strawberry jam, or even peanut butter. The possibilities are nearly endless. Feel free to order straight off the menu, or, if you're a control-freak like me, check out their build-your-own waffle option. Just remember to ask for the buckwheat version, which is completely vegan, and... drum roll, please... gluten-free. Get there by taking the L train to Graham Ave. Or, take the G to Nassau, if you must. So awesome! I'll have to visit next time I'm in NYC. I love the idea of a waffle sandwich! You definitely have to check it out - so good! Hello! I work for a PR company who represents a vegan musician. What would be the best email contact to submit an editorial idea? Thank you! Hi, you can reach me at veggieterrain [at] gmail [dot] com. Thanks for your interest! What a great find! I love love love savory twists on foods that are usually sweet. And really, who doesn't want breakfast food for every meal. Thanks for letting us in on the secret! I completely share your love of making typically sweet foods a bit savory - there's something magical about an unexpected flavor twist! Yay! Hmm... looks delish and might be a good idea for a twist in the next waffle feast.